The Nutcracker has returned to Covent Garden with a bang – kicking off with a matinée performance for primary schools on November 23. There is something magical about the children cheering at the dancing. Some have never seen a ballet before and it makes me wish it was commonplace to have thousands of children filling the auditorium with their untamed gasps and applause every night. A complimentary ticket meant I was able to get a peek into the striking talent in store for the 27 performances before the public show that evening – and what a festive treat it was indeed. Set to Tchaikovsky’s score, The Royal Ballet’s production by Sir Peter Wright returns with a flurry of débuts to mark Wright’s 90th birthday. The ballet begins on Christmas Eve night, when the young Clara (Isabella Gasparini in her début) sneaks down to her living room to play with her newest toy, the Nutcracker, brought to her by the magician Drosselmeyer, who then sweeps her off into a magical land. The Nutcracker (Benjamin Ella) comes to life after a battle with the mice, led by their Mouse King (Lukas Bjørneboe Brændsrød) and, after being saved by Clara, the Nutcracker is returned to his true form – the nephew of Drosselmeyer, Hans-Peter. The two dance with care, sometimes a bit too much – Gasparini’s Clara is young but her ever-curious face was too constant. 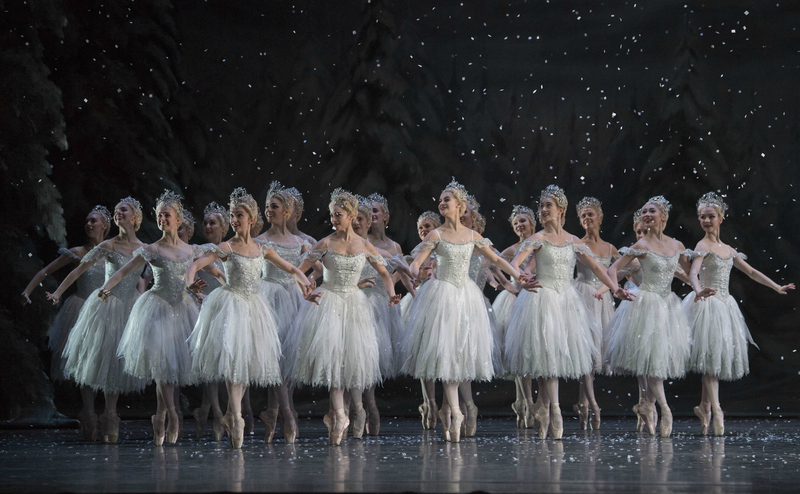 They then travel to the Kingdom of the Sweets where they are greeted by the Sugar Plum Fairy (Yasmine Naghdi) and her Prince (Matthew Ball), and are treated to a display of many dances including a newly choreographed Chinese dance performed by Marcelino Sambé and Solomon Golding. This shone above the others (which include Spanish, Arabian and Russian) as Sambé and Golding turned endlessly and spun each other round and round in gravity defying cartwheel-inspired jumps. These culminated in the Waltz of the Flowers led graciously by the Rose Fairy – a début by Brazilian soloist Mayara Magri. She flourishes here with sharp lines, cutting through the music like thorns accompanied by ravishing turns and breathless balances. In her final manège (a circular pattern around the stage) she bursts with brilliant jetés. And finally, as the children cheered off the acts with ear shattering applause, Naghdi and Ball (both making their débuts) performed their grand pas de deux. As the Sugar Plum Fairy, Naghdi is ever-graceful, her line, long feet and evident musicality sweetening every note as she gathered up the harp’s music and sent it spilling off the tips of her fingers. She suspended moments en pointe before rolling through her shoe and into the next phrase. Though not as technically gifted as Naghdi, nor as flexible, Ball commands the stage and proves a strong partner for Naghdi. The pair will perform once over the Christmas season on 27 December. The performance is sold out but returns and day tickets will become available. The Nutcracker remains in rep until 12 January 2017. For tickets and further details please visit the website of the Royal Opera House. Thank you for your review Kadeem! I wish I could have been there to see it but failing that it is great to hear your impressions as a seasoned ballet afficionado. Thank you !! The only theater production I’ve seen was Catz, and reading this has made me want to give theater another chance, perhaps to explore the dance area of theater. This article was very well written and I look forward to more reviews by Kadeem. Keep being fabulous.